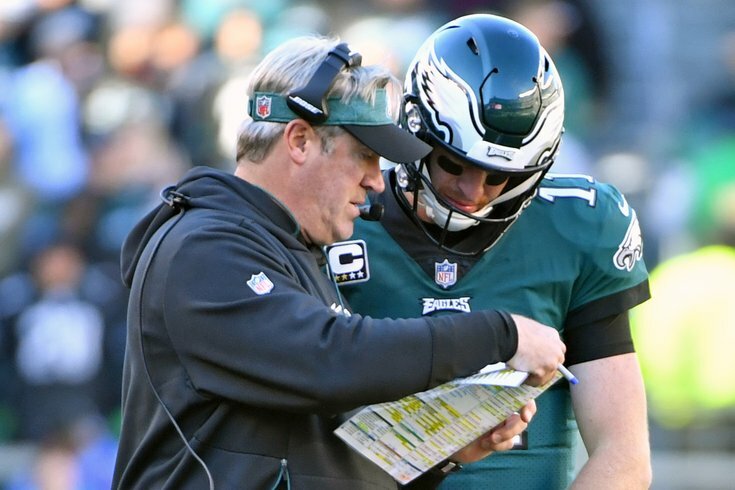 Philadelphia Eagles head coach Doug Pederson and quarterback Carson Wentz go over a play late in the fourth quarter against the Carolina Panthers. "Well, No. 1 — no one is really giving us a chance anyway. Whether we are putting pressure on ourselves to perform, to play — whatever it is, live up to a certain expectation — I think it's that point where I think that no one has given us that type of, maybe with the amount of injuries or whatever it is, given us as much credit going into games." No, that didn't come from last year, when the 2017 Eagles were anointed the underdogs of the sports world. It came Sunday afternoon, shortly after the 2018 Eagles, who have been favored in each of their first seven games, blew a 17-0 fourth quarter lead and fell to 3-4 with a gut-wrenching loss to the Panthers. "Quite frankly, I told them we have to learn form these," the coach said. "These are games that galvanize football teams and this is going to do that. It's going to bring us closer together. Hey, the pressure is off of us. No one in the outside world is giving us a chance to do anything. The pressure is off us we can go have fun and just relax." Wait, wait. "No one in the outside world is giving us a chance to do anything?" After underachieving as the defending Super Bowl champs, and denying repeatedly that a Super Bowl hangover is the Eagles' ailment, it appears the head coach is playing an old classic. He is re-mixing the "no one believes in us" tune that went to the top of the charts last winter. Can it work again? Will anyone even buy it? "We know that we get everybody's best every week and this is a good football team," Pederson said, trying to explain his words a bit more. "We don't use injury, we don't use whatever it might be as an excuse not to perform. Sometimes I think players, coaches just add pressure when they don't have to and that's something that starts with me there and we need to make sure we're doings everything during the week to get there." The Eagles have suffered four losses this season, every single one of them by less than one touchdown and every single one of them winnable with one or two slightly different bounces of the football (like the improbable fourth and 10 conversion the Panthers converted en route to their game-winning touchdown). One could argue that the Eagles have played the worst this year under pressure, failing twice to close games (a 17-0 lead against Carolina and a 17-3 lead against Tennessee) while also surrendering awful lapses in defensive consistency when it matters most. "I think sometimes we force issues," Pederson said. "We try to press just a little bit. We don't have to go searching for plays when plays come we have to make the plays that come to us. And right now were not doing that and I think that takes the pressure thats off of us." Pederson is clearly trying to light a spark in his players. And whether they need to feel like underdogs to play better, or feel less pressure (an unlikely notion for the defending world champions), something clearly needs to change. "A lot of football is left too," he said. "We still have a bunch of games — anything is possible, anything can happen." As seems to be proven this season for the Birds, anything often does happen.